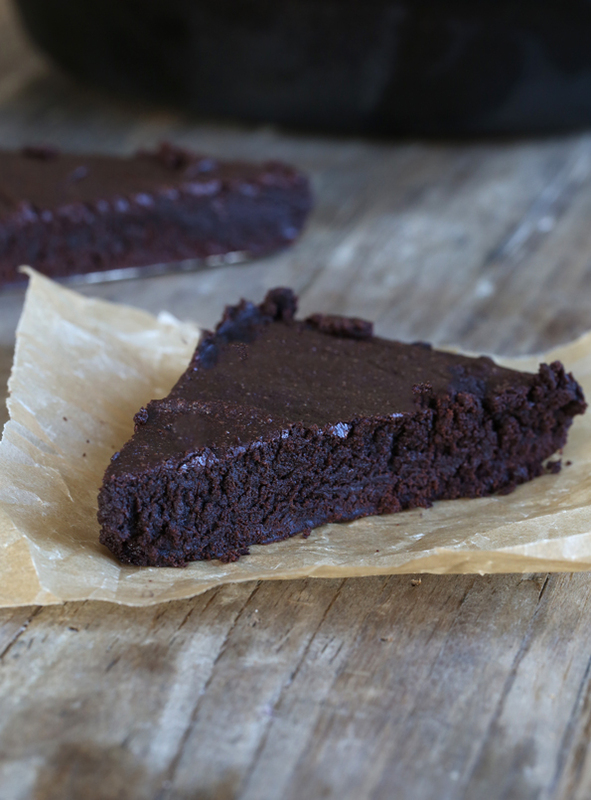 Gluten Free Skillet Brownies | Great gluten free recipes for every occasion. I’m no stranger to gluten free brownies. 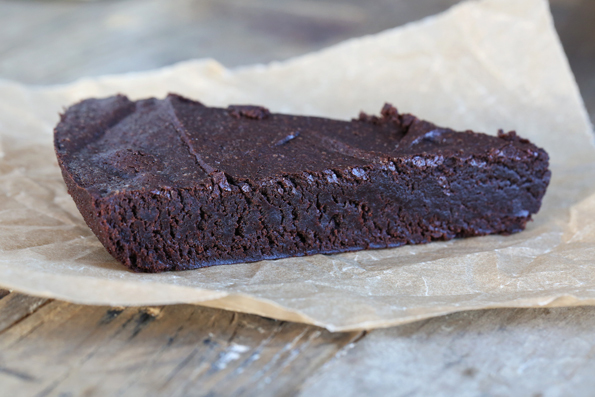 Or even Paleo brownies for that matter. But these are gluten free skillet brownies. That means they’re dense and fudgy with a crisp little crust on the bottom—especially when you make them in a cast iron skillet. And since a cast iron skillet conducts heat so well, they bake very evenly and quickly and are done long before they have a chance to burn on the bottom. Most of the time, I slice them into wedges and serve them right out of the skillet after they’ve cooled and set a bit. But these are the type of brownies that you can serve right out of the oven. In bowls. With ice cream. And chocolate sauce. And oooooohs and ahhhhhs. 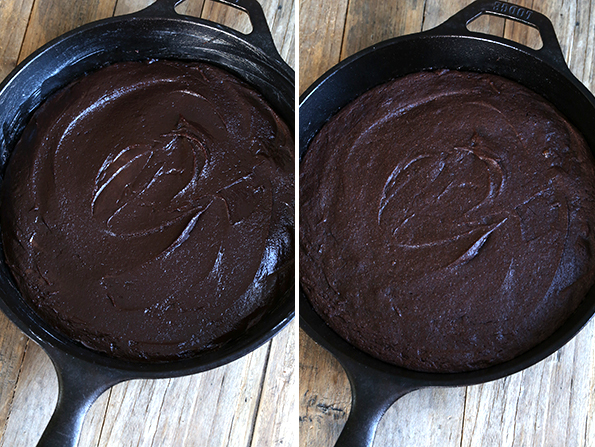 The batter is shiny and smooth when it’s raw, and just set and juuuuuust beginning to pull away from the sides of the skillet when it’s baked. Egg free would be hard, since there are 3 eggs. My go-to egg replacement is always a ‘chia’ egg since it’s the most neutral and effective. It’s just 1 tablespoon (6 grams) chia flour + 3 tablespoons water per egg. Let us know how it goes! Dairy free should work if you use vegetable shortening in place of butter and dairy-free chocolate. Again, let us know how it goes! Remember, I haven’t tested with substitutions, so these are just suggestions! Preheat your oven to 350°F. Grease a 12-inch cast iron (or other oven-safe) skillet and set it aside. In a small bowl, place the chopped chocolate and butter. Melt the chocolate and butter either in the microwave in 30-second bursts or placed over a small pot of simmering water (making sure the bowl doesn’t touch the water, and the water doesn’t boil), stirring periodically until smooth. Set the bowl aside to cool briefly, until no longer hot to the touch. In a large bowl, place the flour blend, xanthan gum, cocoa powder and salt, and whisk to combine well. Add the brown sugar, and whisk again, working to break up any lumps in the brown sugar. Create a well in the center of the dry ingredients, and add the chocolate and butter mixture, then the oil, vanilla and eggs, mixing to combine after each addition. The batter will be thick but smooth. Scrape the batter into the prepared skillet and spread into an even layer with a wet spatula. Place in the center of the preheated oven and bake for 22 minutes, or until the brownies are just beginning to pull away slightly from the sides of the skillet and look set in the center. Allow to cool for about 10 minutes before slicing into wedges or serving. Or serve immediately by scooping out with a large spoon. But if you do it that way, you have to serve it with a scoop of ice cream or what’s the point. P.S. Thank you for your support of Gluten Free on a Shoestring Bakes Bread! It’s a brand new, revolutionary way of making gluten free bread, and you have handled it with grace. Well done!! What about a sub for vegetable oil. I never touch the stuff. I have palm shortening, or sunflower oil, coconut oil? Also would 100% dark baking chocolate work to sub for the bittersweet? Help! We had to throw these out – they turned out terrible. They were super dry and NOT sweet AT ALL.Are there any misprints in the recipe? Deb, there are absolutely not misprints in the recipe. In fact, I made it myself following the recipe from this very page (not from my notes) 2 days ago. If you included all of the ingredients, it’s not possible that it wouldn’t be sweet at all. There is a full 164 grams of light brown sugar in these brownies. Perhaps you omitted an ingredient (or two!). Better luck next time! I am so excited to try this recipe this weekend in our new Log Cabin! Ive been waiting to use my cast Iron in the oven! Stumbling Over Chaos :: Linkity. Making people late for work since 2009. Whoops. I just finished off the last chocolate chip brownie from your first book and I was going to make another batch . They were to die for and I am not the chocolate lover in the house . Now I will try these i stead as I am a huge fan of cast iron and your recipes . Ummmmm I can almost smell them and taste them! I have no qualms about eating crunch, soft, middle, end…whatever! Donia, you can send me what’s left after you scoop your’s out! I’m definitely going to try these brownies. I love using my cast iron skillet (it rocks!) and just the fact that you signed Love, Me. That is something I would do. Are you my long lost twin? Seems to me that you are stuck on chocolate. Could you use Hershey bars to substitute for the bittersweet chocolate ? This looks so good ! yummy, yum, yum! These look fab! I wish my family loved desserts as much as I do….they might if I make this and bring it out some winter evening with good ice cream and warmed up hot fudge. Oh my – now I’m getting excited!!!! Your family doesn’t love desserts??? 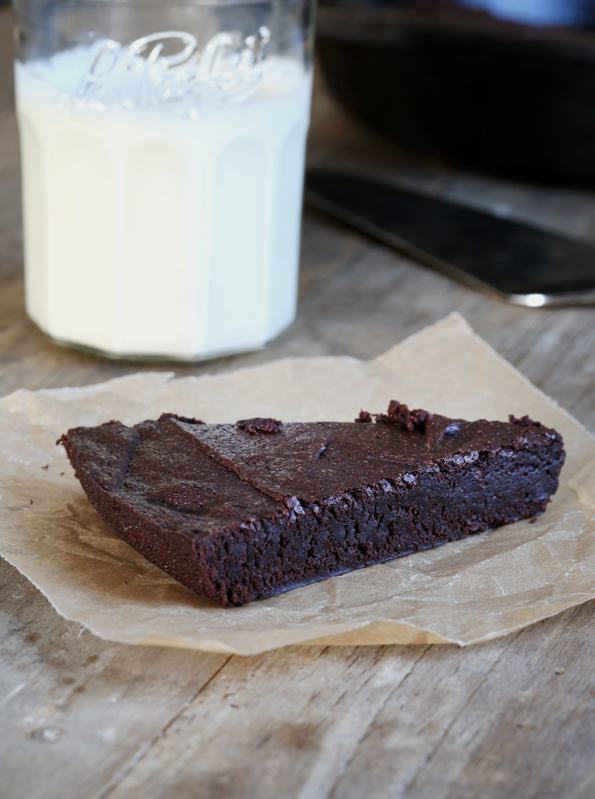 I’ve been looking for a GF skillet brownie recipe and this one looks like a winner! Thanks for sharing! Wow! I don’t know any other words, can’t wait to try this! I am totally on board with scooping this out and serving with ice cream (make mine dairy free) and chocolate sauce. I might, in fact, scoop out the center for myself. These look divine!! !